Covidien Venefit is a minimally invasive, outpatient treatment that is done to help treatment of Chronic Venous Insufficiency. Chronic Venous Insufficiency (CVI) is a medical condition that worsens overtime and affects the veins and vessels in the leg that carry oxygen-poor blood back toward the heart. 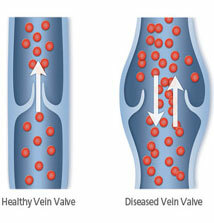 Varicose veins can progress to CVI if left untreated as well. Treatment can be done within our Clinton Township office. This treatment uses radiofrequency ablation (heat) to seal off the problem vein so blood gets re-routed to other veins. Using this type of treatment allows for a quick, comfortable recovery and return to everyday activities, while also improving the appearance of varicose veins. Your doctor will determine if you are a candidate. You can call our office at 586-776-8887 for further questions. © 2017 Cardiovascular Institute of Michigan, P.C. All rights reserved.